A shocking crime triggers a media firestorm for a controversial talk show host in this provocative novel—a story of redemption, a nostalgic portrait of New York City, and a searing indictment of our culture of spectacle. Talk show host Matthew Miller has made his fame by shining a spotlight on the most unlikely and bizarre secrets of society, exposing them on live television in front of millions of gawking viewers. However, the man behind The Mattie M Show remains a mystery—both to his enormous audience and to those who work alongside him every day. But when the high school students responsible for a mass shooting are found to be devoted fans, Mattie is thrust into the glare of public scrutiny, seen as the wry, detached herald of a culture going downhill and going way too far. Soon, the secrets of Mattie’s past as a brilliant young politician in a crime-ridden New York City begin to push their way to the surface. In her most daring and multidimensional novel yet, Jennifer duBois vividly portrays the heyday of gay liberation in the seventies and the grip of the AIDS crisis in the eighties, alongside a backstage view of nineties television in an age of moral panic. DuBois explores an enigmatic man’s downfall through the perspectives of two spectators—Cel, Mattie’s skeptical publicist, and Semi, the disillusioned lover from his past. 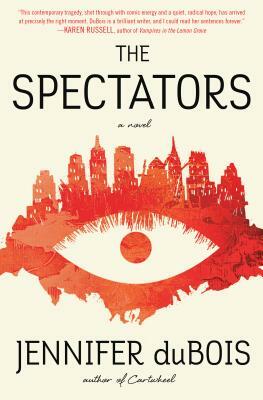 With wit, heart, and crackling intelligence, The Spectators examines the human capacity for reinvention—and forces us to ask ourselves what we choose to look at, and why. Jennifer duBois is the author of A Partial History of Lost Causes, a finalist for the PEN/Hemingway Award for Debut Fiction. The National Book Foundation named her one of its 5 Under 35 authors. Her second novel, Cartwheel, was a finalist for the New York Public Library’s Young Lions Award. An alumna of the Iowa Writers’ Workshop and Stanford University’s Stegner Fellowship program, duBois is the recipient of a Whiting Award and a National Endowment for the Arts Creative Writing grant. She teaches in the MFA program at Texas State University.